1955: Franz Kline lives in the East Village before moving to East 10th Street. 1955: John Ferren becomes responsible for arranging the panels at The Club. 1955: Barnett Newman moves to Brooklyn Heights. Although Rothko had achieved a good price for the painting (at the time) he still lamented his financial situation. January 2, 1955: "Nature and New Painting, by Frank O'Hara I" at the Club. January 14, 1955: "Zen and Psychoanalysis" at the Club. January 15, 1955: Yves Tanguy dies. Tanguy died of a cerebral haemorrhage. (SS416) After his death his wife Kay Sage lived alone in their Woodbury house and became increasingly depressed and alcoholic. She attempted suicide by overdose in 1959. Although she survived that attempt she killed herself after an unsuccessful operation for double cataracts in 1963 by shooting herself in the heart. Her ashes and those of her husband were scattered on the beach at Douamenez in Brittany by Pierre Matisse. January 28, 1955: "Nature and New Painting, by Frank O'Hara II." February 1955: Jackson Pollock breaks his ankle again. February 11, 1955: "Nature and New Painting by Frank O'Hara III" at the Club. February 12, 1955: "Immoral Husband" at the Club. March 4, 1955: Cafe night at the Club. March 11, 1955: Folk Art: Movies of Japanese Prints, by Walter Lewisohn at the Club. Moderator: Sidney Geist. Panelists: Day Schnabel, Albert Terris, Richard Stankiewicz, Clement Greenberg and Ibram Lassaw. The exhibition was organized by The Museum of Modern Art and took place at the Musée d'Art Moderne in Paris as part of the American sponsored "Salute to France" program. April 26 - May 21, 1955: The "Fourth Annual Exhibition of Painting and Sculpture" takes place at the Stable Gallery in New York. Another combine of the same year called Short Circuit is literally a combination of the work of three artist friends within an armature provided by Rauschenberg. In this piece, submitted for an annual retrospective at the Stable Gallery, Rauschenberg protests the exclusion of these friends from the show by smuggling them in through his painting. The combine includes a Johns flag under one door, a painting by Weil under another, and a third image by his friend Ray Johnson. In addition, there is a program from an early John Cage concert and an autograph by Judy Garland. While the participation by friends and lovers is logical given the circumstances, the Garland autograph is a most curious addition, signaling the development of yet another new phase in Rauschenberg's art, a phase again tied to his relationship with Johns. May 11 - August 7, 1955: "The New Decade: 35 American Painters and Sculptors" exhibition at the Whitney Museum of American Art, New York. July 1955: Jackson Pollock gets a passport. Pollock: "What do you think? I'm going to Europe." Pollock: "I don't know if I want to go." Resnick: "What do you want to do?" Resnick: "Sure. Everybody does. So you're going to Europe. What do you want me to tell you?" The summer session lasted eight weeks and paid $1,800. When they reached Boulder they bought a used car which broke down on their way to the University. James Byrnes the director of the Colorado Springs Fine Arts Center had met Rothko in 1951 and had gone to Boulder to visit the artist, only to find him in the broken down car. In a letter dated July 7, 1955, sent jointly to Robert and Betty Motherwell and Herbert and Ilse Ferber, Rothko described the incident: "The car was guaranteed to take us enthusiastically to every point of wonder in the vicinity. It was eight miles up Boulder Canyon that our radiator gave out. We were waving our arms frantically for help and who stopped to help us? Gerry Levine, Mr. and Mrs. Byrnes, Inez Johnson and one dog. It was wonderful to see them, for the smell of their contact with you and of that Paradise, N.Y. still lingered about their clothes." 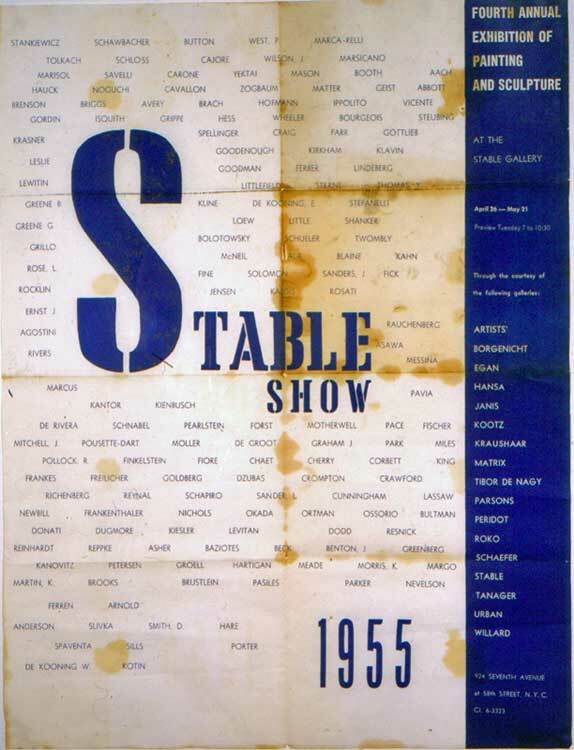 September 26 - October 15, 1955: Lee Krasner exhibition at the Stable Gallery. November 18, 1955: Philip Pavia resigns from the Club to start It is. magazine. December 2, 1955: Dealers panel at the Club. Winter 1955: Willem de Kooning denies he is an Abstract Expressionist. "All painting is abstract because it's constructed, including that of Constable and Courbet. They always talked about naturalism. I wonder what they meant." "Corot today looks like a naturalistic painter, but in his day, they told him nature didn't look like that." "Words and labels are very confusing. We need definitions. I'm not an Abstract Expressionist, but I express myself." The exhibition was organized as a retrospective titled "15 Years of Jackson Pollock." It consisted of sixteen paintings including The Flame (1934-38), Pasiphaë (1943), Gothic (1944), Totem Lesson 2 (1945), The Key (1946), Eyes in the Heat (1946), White Cockatoo: Number 24A, 1948, Autumn Rhythm: Number 30, 1950, Echo: Number 25, 1951, Convergence: Number 10, 1952, White Light (1954), and Search (1955). December 1955: Fortune Magazine publishes "The Great International Art Market." December 1955: Barnett Newman exhibits again.